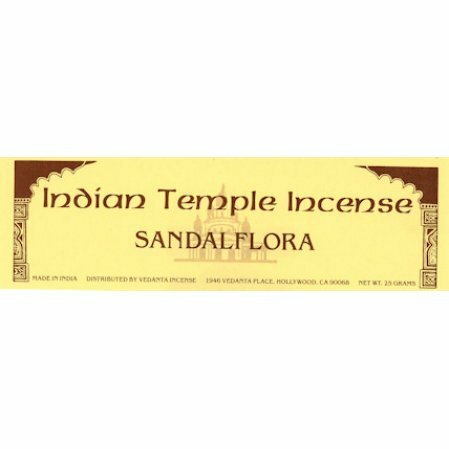 Sandalflora is a popular incense to burn in our temple. It is a light fragrance with a touch of sandalwood, and is part of our Indian Temple Brand. Sandalflora has such a soft scent; I love it! I have been enjoying it for more than 50 years. I love the Sandalflora incense and especially like the ability to get it in the larger 100 gram size. It has been a classic for years. The incense are not too thin so they don't stop burning before finished. The diameter is perfect. A flowery tone to the traditional sandalwood smell will make you feel like in celestial place. It transports me to another realm. A must for the devotee who wants some smell in between the woody and the flowery.